Yesterday on my run, I ran past a local Catholic church that had a sign advertising: "Don't Forget! Lenten Fish Fry This Friday!" Fish Fries are a lot of fun, but fried anything seeps with calories and fat. If you're looking for some super seafood and fish recipes to make at home, these are among my favorite. Bonus: no fried-food-hangover after you eat them! 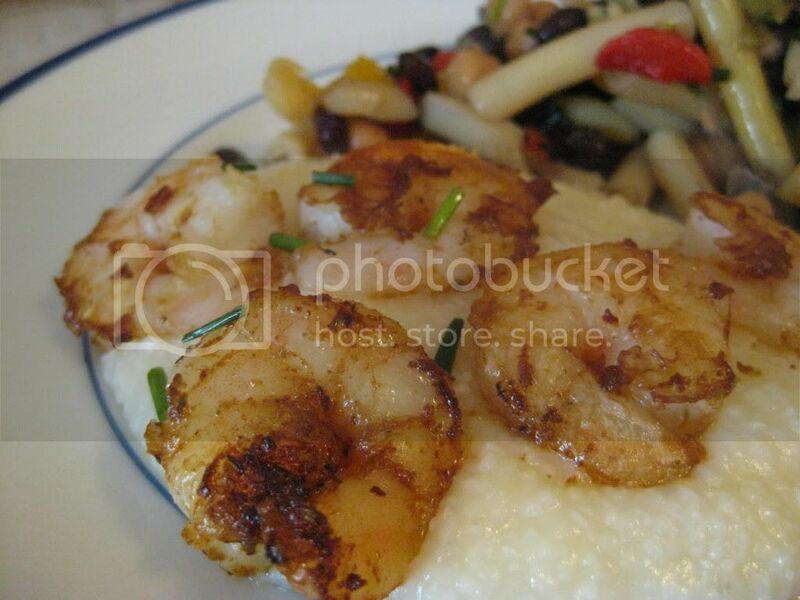 Easy Carolina Shrimp and Grits: I never like grits until I met my North Carolina-born husband. There are a few tricks to great grits, and once you've tasted good grits, you'll be hooked! This recipe is a great time-saver for a busy night. Simple Potato Chip Flounder: Use baked potato chips to "bread" the fish, and bake it in the oven. Bonus: it is gluten-free! 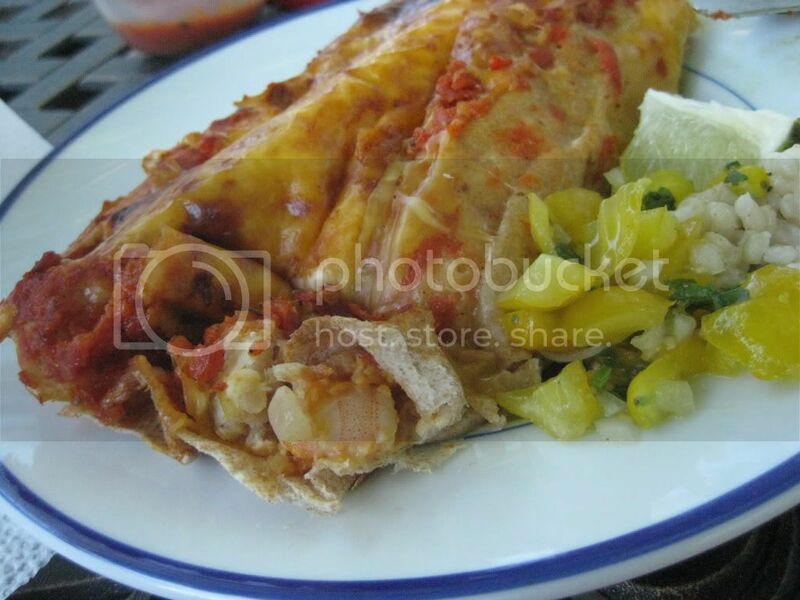 Seafood Enchiladas: One of our family's favorite ways to eat seafood. Enchiladas made with cooked seafood without a heavy cream sauce. Delish! Asian Salmon Burgers: Yum. The symphony of Asian flavors tones down the Salmon, which often can have a strong taste, especially for younger palates. Olive Bar Fish: A trip through your local grocery store olive bar is all you need to make this Mediterranean fish recipe. One of R's favorite recipes. Sadly, no picture, since it is an oldie (but goodie! )...don't let the lack of picture dissuade you from trying it! Shrimp "Ceviche": Feeling like a trip to the islands? This recipe is sure to conjure up images of you lying on the beach, toes in the sand and the gentle sound of waves in the background. Sure, it's March, but you'll be feeling beach-y in no time. The shrimp (or you can use another firm fish) is cooked, so you don't have to worry about raw seafood in this ceviche. Serve this with baked tortillas and refried beans for dinner! Blood Orange Sauced Fish: Pan-seared fish (Orange Roughy, Flounder, Cod, Tilapia would all work beautifully) drizzled with a tangy-sweet blood orange and ginger sauce. The boys devour this recipe, and frankly, so do I, albeit with a wee bit more couth. With these super seafood recipes, you're ready for Lenten Fridays or a special seafood dinner!